In the Fall 2014 semester, students in History 214: The American Civil War and Reconstruction class got help from DASIL to explore data about black soldiers who enlisted in the U.S. Army during the Civil War. Where did black soldiers come from? What kinds of economic and social factors influenced their experiences? Students read an article by the very creative economic historians Dora L. Costa and Matthew E. Kahn, “Forging A New Identity: The Costs and Benefits of Diversity in Civil War Combat Units for Black Slaves and Freemen” (2004),” which used a variety of census, enlistment, and pension data to examine some of the effects of serving in the military on the almost 200,000 black men who enlisted in the U.S. Army after 1862. 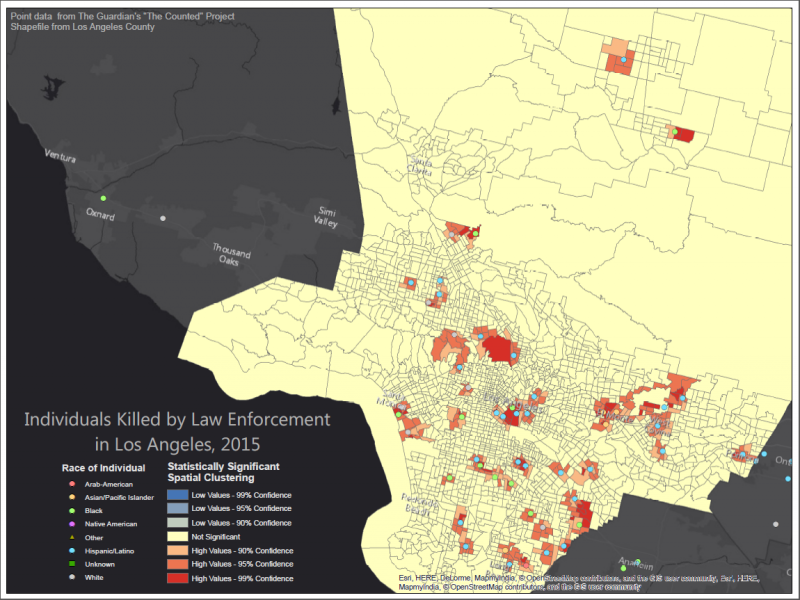 Students had also read several articles that used Geographic Information Systems to do spatial analysis, and I was interested in doing an in-class exercise to help them think critically about military data and to introduce them to using the GIS technology. DASIL Director Kathy Kamp, Post-Baccalaureate Fellow Sara Sanders, and DASIL student Harry Maher worked with me to design an exercise that could help students to visualize data about black soldiers for themselves and to think about the effects of geography on black enlistment. We used a dataset on “Union Army Recruits in Black Regiments in the United States Army 1862-1865” compiled by Jacob Metzger and Robert A. Margo available through the ICPSR as a starting point. The DASIL staff created tables that contained the Metzger and Margo data, along with 1860 census information on population and agricultural production and some tables on black enlistment from Freedom’s Soldiers: The Black Military Experience in the Civil War (Berlin, Reidy, and Rowland, 1998). We worked together to create a GIS exercise based on the data that could whet the students’ appetites for working with spatial data in just one class period. 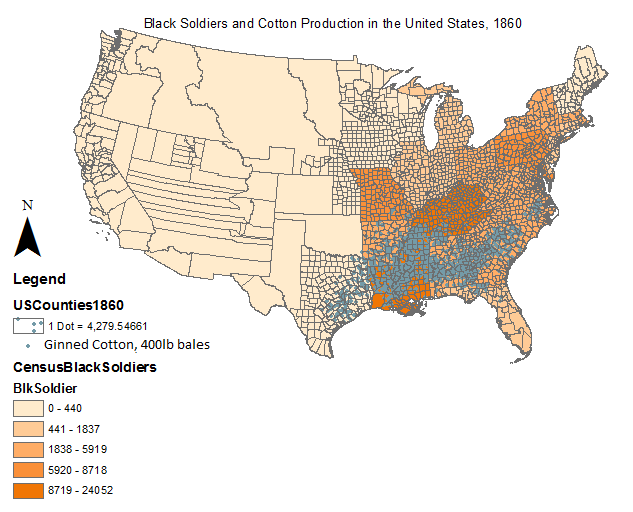 The in-class exercise had two points: to get the students thinking about the nature of the datasets and to have them use ArcGIS software to create maps that showed the relationship between the proportion of black soldiers enlisted in relation to the total population by state and cotton production by county. The Metzger and Margo dataset is based on a judgment sample, so students were able to examine the dataset alongside census records to appreciate how judgment samples do not include comprehensive data. Nor do they represent a random, representative sampling of black soldiers. But used alongside the census data and the tables from Freedom’s Soldiers, the data were still able to help them form some useful conclusions.